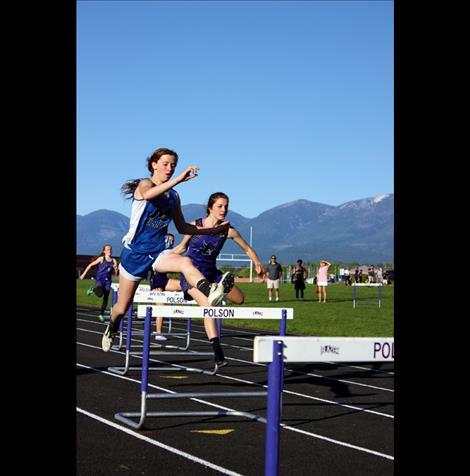 Polson’s Jacob Clairmont and Colton Cote race through the hurdles at an earlier meet. 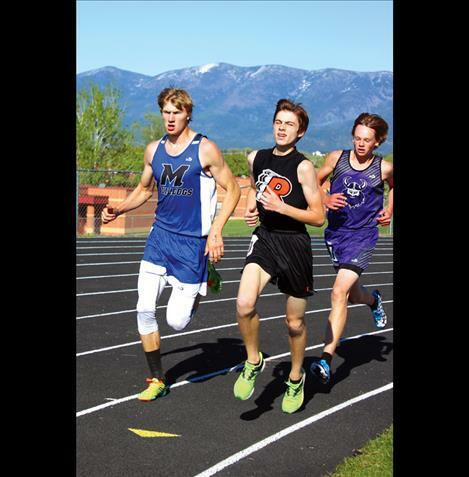 MISSOULA – Ronan and St. Ignatius competed in The Western B Divisional this past weekend. Ronan Maiden’s’ Lee Camel was the top jumper, winning the long jump with a bound of 16 feet and five inches. Teammates Ashley McCready and Ally Buhr also took home a first place prize. McCready won the 3200- meter run with a time of 12 minutes and 19 seconds and Buhr was the top placer in pole vault with a jump of nine feet and six inches. Ronan Chief Jackson Duffey finished second in the 3200-meter run with a time of 10 minutes and 30 seconds. The Maidens finished fourth and the Chiefs finished sixth in Western B Divisional. 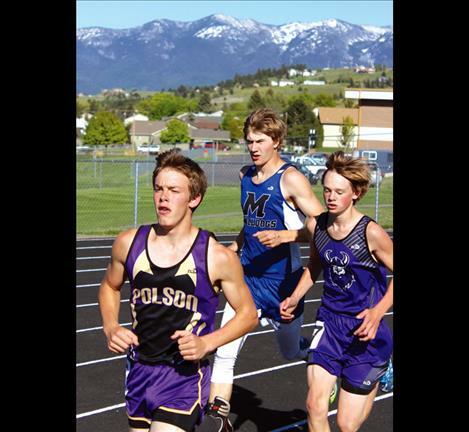 Both the Mission girls and boys track and field team finished tenth. Athletes that qualified by time or in the top six will continue their season at the MHSA Championships on May 26-28. Team scores: 1, Thompson Falls 125.5. 2, Eureka 75. 3, Bigfork 67. 4, Deer Lodge 65.5. 5, Loyola 58. 6, Ronan 44. 7, Florence 38. 8, Troy 36. 9, Libby 17. Mission 1. 200 - 1, Sean Opland, Troy, 22.97. 2, Cade Benjamin, DL, 23.00. 3, McKenzie Holt, TF, 23.29. 4, Josh Wulfekuhle, TF, 23.53. 6, Mitchell Odden, DL, 23.86. 400 – 1, Matt Farrier, Big, 51.94. 2, Dean Klakken, Flo, 52.36. 3, Josh Wulfekuhle, TF, 52.91. 4, Hugo Schyberg, Big, 53.00. 5, Logan Nelson, Lib, 53.50. 6, Ezekiel Misa, Ron, 53.98. 800 - 1, Marcus Zeiler, Flor, 2:03.23. 2, Sean Carroll, TF, 2:05.33. 3, Stormee Kipp, Loy, 2:06.29. 4, Tanner Laws, TF, 2:06.53. 5, Tim Goodman, Libby, 2:07.34. 6, Nathan Dennis, Ron, 2:07.42. 1600 – 1, Logan Morley, Big, 4:26.92. 2, Tanner Laws, TF, 4:45.39. 3, Sean Carroll, TF, 4:47.61. 4, Stormee Kipp, LSH, 4:49.34. 5, Tim Goodman, Lib, 4:49.52. 6, Jackson Duffey, Ron, 4:52.05. 3200 - 1, Logan Morely, Big, 9:22.12. 2, Jackson Duffey, Ron, 10:30.09. 3, Tanner Laws, TF, 10:32.05. 4, Sean Carroll, TF, 10:32.46. 5, Sam Reilly, Loy, 10:33.90. 6, Michael Diller, Lib, 10:34.01. 100 Hurdles - 1, Josh Wulfekuhle, TF, 15.96. 2, Cannan Smith, Eur, 16.23. 3, Jake Gascon, TF, 16.41. 4, Brian Peck, Lib, 16.61. 5, Ethan Olson, Big, 16.78. 6, Aaron Misa, Ron, 16.87. 300 Hurdles - 1, Josh Wulfekuhle, TF, 40.27. 2, Cannan Smith, Eur, 41.48. 3, Matt Farrier, Big, 41.936. 4, Garrett Strine, TF, 42.16. 5, Aaron Misa, Ron, 43.47. 6, Ezekiel Misa, Ron, 43.67. 400 relay – 1, Deer Lodge (Brandon Porter, Cade Benjamin, Dyllon McDermid, Riley Boese) 44.88. 2, Loyola 44.91. 3, Thompson Falls 44.91. 4, Florence 45.67. 5, Libby 46.26. 6, St. Ignatius 46.45. 1600 relay - 1, Bigfork 3:32.39. 2, Thompson Falls, 3:34.59. 3, Loyola 3:36.97. 4, Eureka 3:37.68. 5, Ronan 3:38.43. 6, Florence 3:39.92. Discus - 1, Austin Forson, DL, 153-08.50. 2, McKenzie Holt, TF, 144-02.50. 3, Ross Coleman, Big, 143-08. 4, Isaac Sturdevant, Eur, 135-02. 5, Kaelan Yanak, Eur, 135-00. 6, Bridger Dragoo, Flor, 128-11. Javelin - 1, Cannan Smith, Eur, 162-06. 2, Caden Venters, Flor, 162-00. 3, Sean Opland, Troy, 153-03. 4, Dominic Voorhies, Lib, 144-09. 5, Garrett Graves, Eur, 143-08. 6, Kasey Mock, Ron, 142-04. High jump - 1, Strother Cooper, Loy, 6-02. 2, Sean Opland, Troy, 6-00. 3, Connor Thorne, Flo, 6-00. 4, Brylee Freund, Troy, 5-10. 5, Brandon Porter, DL, J5-10. 6, Garrett Graves, Eur, J5-10. 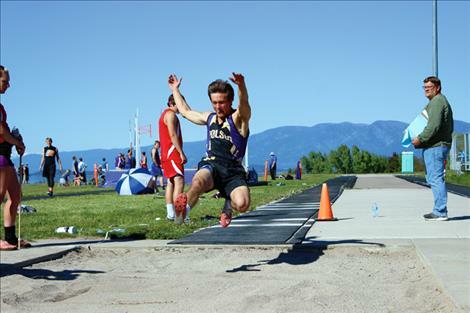 Triple jump - 1, Lucas Blankers, Eur, 41-05.5. 2, David Silgen, Ron, 40-09.00. 3, Garrett Graves, Eur, 39-07.5. 4, Steven Flesch, Ron, 38-11.5. 5, Kade VanElswyk, TF, 38-11.00. 6, Jake Gascon, TF, 38-10.50. Long jump – 1, Cade Benjamin, DL, 21-1. 2, Strother Cooper, LSH, 20-4.5. 3, Kellen Round, LSH, 20-4. 4, Jacob Byrne, LSH, 20-3. 5, Jake Gascon, TF, 19-10. 6, Lucas Blankers, Eur, 19-4. Pole vault – 1, Jake Gascon, TF, 13-6. 2, Collin McGuyer, Ron, 11-6. 3, Cody Garrison, TF, 11-0. 4, Nick Froehlich, Ron, 11-0. 5, Cannan Smith, Eur, 11-0. t-6, Colter Scully, DL, 10-6. t-6, Garrett Strine, TF, 10-6. 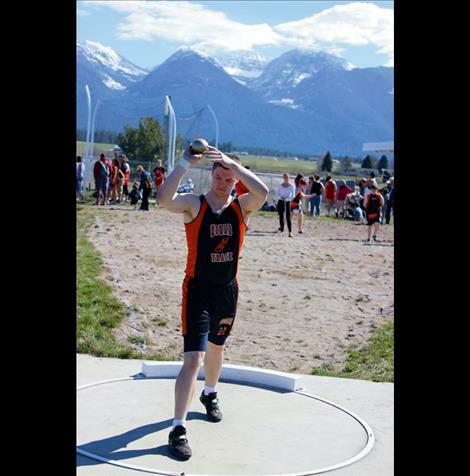 Shot put – 1, Kaelan Yanak, Eur, 47-3.5. 2, Ross Coleman, Big, 46-9.25. 3, Austin Forson, DL, 45-9. 4, Miles Plemmons, Eur, 43-3.75. 5, Owen Davis, Eur, 45-2. 6, Isaac Sturdevant, Eur, 44-4.5. Team scores: 1, Bigfork 110. 2, Libby 90. 3, Deer Lodge 66.5. 4, Ronan 61. 5, Loyola 60. 6 Thompson Falls 58. 7, Eureka 49.5. 8, Florence 21. 9, Anaconda 8. Mission 3. 100 - 1, Brook Kolar, Loy, 13.10. 2, Ceci Benson, Loy, 13.36. 3, Haile Norred, Big, 13.44. 4, Jordan Nelson, Big, 13.50. 5, Kaylee Kronsperger, Eur, 13.60. 6, Darcy Walker, DL, 13.61. 200 - 1, Brook Kolar, Loy, 27.18. 2, Haile Norred, Big, 27.36. 3, Jordan Nelson, Big, 27.51. 4, Darcy Walker, DL, 28.17. 5, Kaylee Kronsperger, Eur, 28.35. 6, Sidney Stevenson, Lib, 28.39. 400 – 1, Haile Norred, Big, 1:01.49. 2, Mattison McAnaly, Big, 1:01.75. 3, Alicia Kalenak, Big, 1:03.08. 4, Autumn Round, Flo, 1:03.14. 5, Sidney Stevenson, Lib, 1:03.63. 6, Brook Kolar, LSH, 1:04.03. 800 - 1, McKay Guckenberg, Eur, 2:29.83. 2, Emily Mossburg, Lib, 2:30.56. 3, Lauren Thorstenson, Lib, 2:34.29. 4, Ashley McCready, Ron, 2:34.97. 5, Bailey Strader, Loy, 2:39.00. 6, Margaret Thompson, DL, 2:41.92. 1600 - 1, Lauren Thorstenson, Libby, 5:41.15. 2, Ashley McCready, Ron, 5:51.46. 3, Tyann Totten, Eur, 5:47.39. 4, McKay Guckenberg, Eur, 5:48.71. 5, Ameila Wood, Ana, 5:49.03. 6, Beti Lombardi, DL, 5:53.42. 3200 – 1, Ashley McCready, Ron, 12:19.50. 2, Lauren Thorstenson, Lib, 12:20.67. 3, Tyann Totten, Eur, 12:24.29. 4, Amelia Wood, Ana, 12:24.39. 5. Bailey Strader, LSH, 12:48.40. 6, Beti Lombardi, DL, 13:05.49. 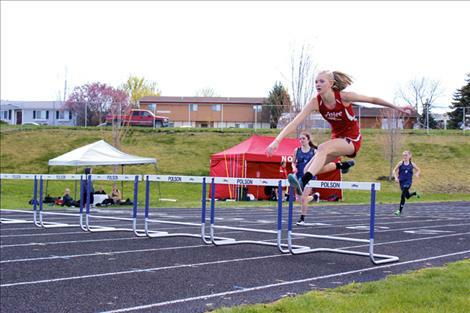 100 Hurdles - 1, Tessa Burke, Loy, 15.95. 2, Mattison McAnaly, Big, 16.97. 3, Alexis Taulbee, Flor, 17.24. 4, Emma Gruber, Lib, 17.32. 5, Lindsey Seitzinger, Anac, 17.62. 6, Skylar Hollenback, Loy, 17.62. 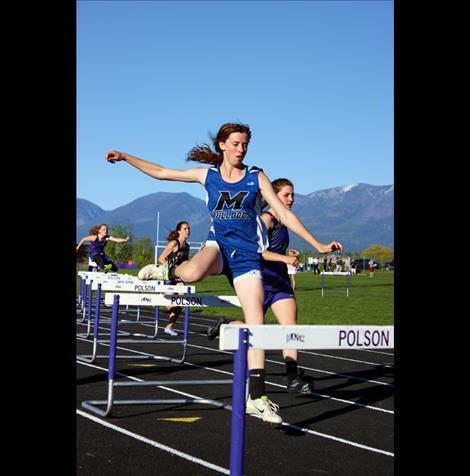 300 Hurdles - 1, Mattison McAnaly, Bigfork, 46.40. 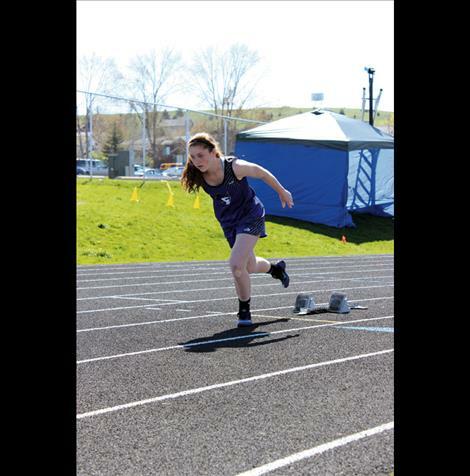 2, Tessa Burke, Loyola, 48.41. 3, Kamryn Scully, DL, 49.75. 4, Shey Hannum, TF, 49.81. 5, Emma Gruber, Lib, 50.05. 6, Alexis Taulbee, Flor, 50.60. 400 relay – 1, Bigfork (Jordan Nelson, Madison Gardner, Mattison McAnaly, Haile Norred) 50.90. 2, Deer Lodge 51.19. 3, Eureka 51.84. 4, Libby 52.77. 5, Loyola Sacred Heart 53.86. 6, Ronan 54.28. 1600 relay -1, Bigfork 4:11.69. 2, Libby 4:16.95. 3, Powell County 4:20.65. 4, Lincoln County 4:21.66. 5, Florence 4:33.05. 6, Loyola 4:36.14. Discus - 1, Miranda Campbell, Big, 108-10.50. 2, Brionna McJunkin, TF, 99-01.50. 3, Bethany Frato, TF, 98-07.50. 4, Chelsea Chaput, DL, 95-05. 5, Nalani Linsebigler, Miss, 91-09. 6, Shelbie McLinden, Lib, 87-05. Javelin - 1, Mikayla Stone, DL, 104-07. 2, Shannon Reny, Libby, 103-09.50. 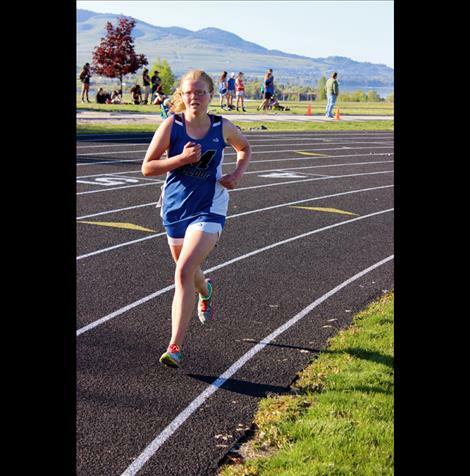 3, Madison Wheeler, TF, 102-07.50. 4, Shey Hannum, TF, 100-02.50. 5, Jenna Komac, Eureka, 96-04. 6, Jaicee Senecal, DL, 95-09. High jump - 1, Shey Hannum, TF, 5-02. 2, Emily Mossburg, Lib, 5-00. 3, Kaylee Kronsperger, Eur, 4-10. 4, Mikayla Stone, DL, 4-08. 5, Krysten Mossburg, Lib, J4-08. 6, Kiernan Tullis, Eur, J4-08. 6, Kerstin Cooper, DL, J4-08. Triple jump - 1, Lee Camel, Ron, 34-11.50. 2, Autumn Round, Flor, 34-04.50. 3, Shey Haunnum, TF, 34-02. 4, Reese Nissen, Big, 33-06. 5, Tessa Burke, Loy, 33-03. 6, Jessica Wilson, Eur, 32-11.50. Long jump – 1, Lee Camel, Ron, 16-5. 2, Shey Hannum, TF, 16-4.25. 3, Lenora Campbell, DL, 15 9.5. 4, Abigail Creighton, Lib, 15-9. 5, Tessa Burke, LSH, 15-8.5. 6, Ceci Benson, LSH, 15-6. Pole vault – 1, Ally Buhr, Ron, 9-6. t-2, Kamryn Scully, DL, 8-6. t-2, Madison Wheeler, TF, 8-6. t-2, Gabby Eaton, Big, 8-6. 5, Abigail Creighton, Lib, 8-6. 6, Jaicee Senecal, DL, 8-0. Shot put – 1, Shannon Reny, Lib, 34-2.5. 2, Lee Camel, Ron, 33-1.5. 3, Ariel Clark, DL, 31-0. 4, Miranda Campbell, Big, 31-0. 5, Shelbie McLinden, Lib, 30-10.5. 6, Mariah Durglo, SI, 30-0.